Artisans set up shop in your camp. With luck and skill, you’ll survive more than a few battles, and find yourself looking to replace your worn-down or outdated equipment. This is wise. You can buy new items from merchants. You can find new items in treasure chests, or clutched by decaying skeletons (both moving and unmoving). But, with the help of some talented allies, you can also create new items, and upgrade existing ones. Haedrig Eamon, the Blacksmith, is able to craft and repair weapons and armor, and salvage crafting materials from your unwanted items. Covetous Shen, the Jeweler, can construct jewelry and combine lesser gems into more powerful ones. He can also remove gems from items' sockets, so that you can insert better gems or move them to different pieces of equipment. Myriam Jahzia, the Mystic, can enchant items, allowing you to change their magical properties. She can also transmogrify equipment, changing its appearance for an appropriate fee. After you earn the services of these artisans in-game, you’ll be able to access them in towns and in your camp. Though they’re out to help you, they’ll require materials (and money) to produce their wares, and you’ll need to provide those. Talking to an artisan will bring up several options, including a list of all the recipes you’ve learned. After selecting the item you want to craft, you can choose to craft the item once or multiple times by queuing up a specified number. Haedrig can salvage your items. 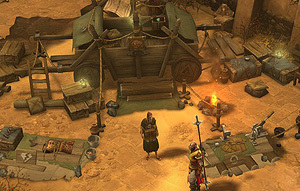 Most commonly, you’ll acquire crafting materials by salvaging items that you don’t need. When you acquire an item that isn’t an improvement over your current gear, you can sell it to a merchant for gold, or salvage it by speaking to Haedrig, the Blacksmith. Every piece of gear you can wear can also be salvaged for materials, from common (white) items all the way to legendary and set items. Each salvaged item yields different materials based on your level and the quality of the item. You can check your current supply of crafting materials by opening your inventory and clicking the anvil icon on the bottom left (PC) or by navigating the radial menu to the bag icon and selecting the anvil in the submenu (PS4 or Xbox One). You can also improve your artisans by giving them gold and materials to buy new equipment and further train their skills. With enough practice, they’ll gain a level and unlock the knowledge required to craft even better items. You’ll find unique recipes in your travels: formulae and plans that you can share with your artisans. Some of the most valuable and precious items in the game must be forged or designed from plans found this way.